We took 2 tours with Green Peru Adventures and we had a wonderful time. All was well planned and organised. Our tour guides were very friendly, patient and knowledgeble. We learnt so much about the Inkas and Cuzco. I highly recommend Green Peru Adventures. Leo also took us on his motor bike and showed us other places. 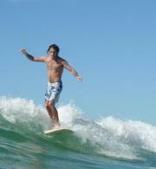 He’s a very nice, energetic and friendly tour manager who will go an extra mile to help you enjoy your vacation. Thank you so much Leo. Green Peru Adventures organized my trip to the Lake Titicaca where I spent two days visiting the islands and spending a night on one island in the house of the people from local community. We got to see their way of living and their customs. They borrowed us their traditional cloth and we had a party at night where we all danced with the locals to Andian music. It was so much fun. I really enjoyed the experience. Our guide was also excellent. He had plenty of interesting stories for us, so we got to learn a lot. I am very satisfied with the service provided by Green Peru Adventures also for the very competitive prices. I would highly recommend this agency. I went through Green Peru Adventures to book my trip to Machu Picchu and it turned out great. I did the Inka Jungle Trek: one day of Downhill Mountain biking, two days of hiking and one day at Machu Picchu. The biking was incredible: I never imagined I’d be navigating narrow Andean roads on a bicycle and it was exhilarating. We hiked through beautiful scenery, ending up at the Santa Theresa hot springs, which were lovely. That night we partied with the locals as they celebrated their town’s anniversary. And of course, Machu Picchu was the icing on the cake. The price was good, the service was excellent: all in all I thoroughly enjoyed my experience with Green Peru Adventures. Thanks Green Peru Adventures for organising our Salkantay Trek to Machu Picchu. All details were explained thoroughly. And we got everything we expect plus more. The highlight was our guide, Miriam. She was personal, professional, friendly, fun and knowledgeable. I just want to drop a line to tell you that we had a blast! I am glad the wind picked back up for us. Our guide and his assistant could not have done a better job. Thanks again! Thank you again for your help during our stay in Cusco. The multiple rides you’ve organized have been perfectly arranged, the driver was pleasant and efficient, and we will keep an unforgettable memory of all this trip. You set up the 2 day Sacred Valley tour for me in January. I just wanted to say thank you. I had an amazing time!!!! I really appreciated you booking me for Huyana Pichu and the 7 pm train leaving Aguas Calientes. Spent 10 wonderful hours at Machu Pichu. Thanks again! I hope you are well. Loan Agent, Wymac Capital, Inc.
Fantasticol! I learned a lot about the Incas in culture, and I got to see villagers living on the mountain side as they have for 100 of years. 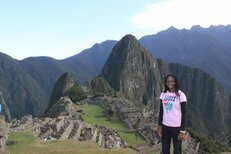 I am inspired to learn Spanish, so that I can travel & communicate more freely in Peru, & South America. Thanks to JC ! & GREEN PERU ADVENTURES for making this trip the most memorable experience I’ve ever had. Best part of our South America trip! We didn’t want to be in a canned tour but also wanted to have some things pre-arranged. Roland was exceptional in his follow through, his kindness upon our arrival and hospitality throughout our stay in Cusco. He went above and beyond by arranging for a purchase to be bussed to me in the next leg of our journey when the shopkeeper didn’t open in time!! You can’t go wrong with him. My wife and I have been to Peru multiple times and we always book our tours with Green Peru Adventures (Leo). Excellent communication and attention to details, Leo (the owner) has never let us down. Honest and trustworthy. Recommended. I stayed a week in Cusco and hired the company Green Peru Aventures for 2 days at Machu Picchu, and other activities in Cusco. I can say that the service is wonderful! The owner, Roland Leonardo, is extremely attentive and friendly, and speaks fluent English, Spanish and Dutch. Perfect! Our first two days were set up by a tour company, Green Peru Adventures, and if you’re going to visit Peru I highly recommend them! They set up all of our transportation and tours, and everything went so smoothly and was great! Also, the next day Roland and some of the people that work for him showed us around Cusco! It was so nice of them! They took us to a food festival that had all sorts of different peruvian foods, and bought us lunch! My wife & I used Green Peru for 2 full day tours in Cusco, a full day lake Titicaca tour & a 2 day Colca canyon tour. Leo was wonderful. Coordinated everything perfectly. I was in touch with him on email for a while trying to finalise the tours. He was reasonably prompt with responses & patient with innumerable queries from me. But what he brought to the table was his personal touch. He came personally to pick us up from the airport. The night we returned from Machu Picchu, he came to pick us up from Poroi & joined us for dinner. Found an excellent restaurant, Chi Cha, where he managed to get us in without prior reservation! I whole heartedly recommend Green Peru Adventures to everyone based on my personal experience. Yes, they are relatively new but are willing to go the extra mile. Roland, way over due but here is the most amazing Man of Peru who knows everything you need to know about everything! Thanks again hope all is well. We are now back home in the US, and I wanted to take a moment to thank you most sincerely for your services, and for Javier and Victor. We so appreciated the care you took with us as we arrived in Cusco and as we needed to make alternate arrangements to come back before the rail strike. My mother and my mother-in-law appreciated the chance to nap in your office, while we enjoyed getting to know you over breakfast. I thought we would get to see you before we left, so I apologize for not thanking you more properly when you left us at the Ollantaytambo train. We had a wonderful time at Machu Picchu! A colleague of mine who almost always arranges his own excursions, instead used Green Peru’s “2 days classic tour by train to Machu Picchu” and said it was money well spent. I followed his advice and arranged for the same excursion to Machu Picchu for my wife, son, his girl friend, and myself. It was an excellent investment. We rented an apartment in Cusco for 7 days through a well-known online apartment-renting marketplace. On day 2 of our trip we checked in with Green Peru at their offices in Cusco where we picked up our round trip tickets for the Inca Rail train (from Ollantaytambo to Aguas Calientes), round trip Machu Picchu bus tickets (from Aguas Calientes to Machu Picchu), the passes for Machu Picchu, and a Peruvian cell phone for contacting Green Peru during the excursion in case anything came up (it didn’t). On day 3, after acclimating to the altitude, our excursion began at 4:30 a.m. Green Peru arranged for a private taxi ride from our apartment to Ollantaytamo train station, about a 1:45 minute ride. Then we took an Inca Rail train to Aguas Calientes (another 1:45 hours) where we proceeded to our hotel. The hotel was modern and quiet, with very nice rooms. Two of our party napped while two others hiked along the river to Los Jardines de Mandor – ask Green Peru for directions when checking in. After having dinner, we met our guide at our hotel at 7 p.m. for a pre-Machu Picchu briefing. The next morning we were up at 4:30 again, had a very nice (included) buffet style breakfast at our hotel, and then we were in line for the Machu Picchu buses by 5:30 a.m. We arrived at Machu Picchu main gates at approximately 6:45 a.m. where we met our guide. I’m pretty sure the guides have to be registered with the Machu Picchu Park Services, so it seems unlikely that you can get a bad guide. Our guide (arranged for by Green Peru) had a university degree in tourism focusing on Machu Picchu from a university in Cusco. He was very knowledgeable, patient, answered all questions from our group, and provided us a great tour. Two months earlier, just after making the initial reservations, I was called at my U.S. phone number by Green Peru asking if I would like to arrange for passes to hike to the top of Machu Picchu mountain which overlooks the Machu Picchu ruins. I agreed to this extra hike so our Machu Picchu tickets also allowed us to do the hike. This is a pretty strenuous hike, but well worth it if you’re in shape. After our guided tour of the ruins, it took us about 1:30 hours of climbing steps made of rocks to reach the summit of Machu Picchu Mountain which is 2000 feet above the ruins and from what we can tell by looking online, it is at about 10,000 feet altitude. After hiking back down to the ruins we returned by bus to Aguas Calientes where we ate a late lunch and waited for our evening train back to Ollantaytambo, and from there our private taxi back to Cusco. We arrived back at our Cusco apartment at about 10 p.m. Here’s what to bring for your visit to Machu Picchu: a refillable water bottle, snacks (e.g., trail mix, PB&J), sunscreen, removable layers of clothing (50 degrees in the morning but heats up as the morning wears on), hat to block the sun, camera, and a small backpack for carrying it all. For our climb of Machu Picchu Mountain we all had at least 1.5 liters of water at the outset. A person behind me on the climb did not bring water and I shared a half of a liter. For down time (e.g., while waiting for the evening train), bring a deck of cards, a book to read, and money for shopping. My friends and I used Green Peru Adventures for our paragliding excursion and I can’t say enough great things about the company! Roland, in the office, went above and beyond to help us have a great experience, not just paragliding but our entire trip to Peru in general. He helped us find transportation between cities as well. The paragliding trip was one of the coolest things I’ve ever done. Jose was an amazing guide and you could tell he really loved to fly. He was also great about creating an enjoying flight for everyone in our party (I get motion sick more easily than my friends so he made sure to keep my flight calm and not do too many crazy thermal lifts). I would recommend this company and a flight with Jose to anyone visiting Peru. The Sacred Valley is of the most beautiful scenery I’ve ever witnessed. It was awesome to experience it that way and it felt completely safe!! We used Green Peru Adventures to book a paragliding excursion and it was the best experience. Roland was good at communicating and when we went to the office to put the final touches on our trip he helped us with other things as well. The actual paragliding itself was indescribable. It was among the most beautiful scenery I’ve ever seen and the guide, Jose, was a pro and we felt very safe. It happened to be just 2 guides and my other 2 friends on top of a mountain taking off to fly over the Sacred Valley so it was an intense and intimate experience. I can’t say enough good things about this experience. Thank you Roland and Jose for the experience of a lifetime!!!! !